“It’s just not right,” said Lia. “We’re racing here and these guys are in the way. NASCAR won’t do anything about it. They need to get on their game with that. It’s not fair. We’re 100 laps in and working a big pack of lapped traffic and they aren’t throwing the [passing] flag. They need to be waving that flag. It’s lapped traffic, they need to pull down and get out of the way. 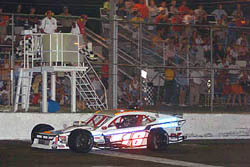 The battles with the lapped cars allowed Hirschman to close up late in the race. A restart with three laps to go gave the crowd, and Lia, the idea that anything could happen. But while Lia was on worn tires, so was Hirschman, and a classic battle just wasn’t going to happen. Fifty miles really isn’t a very long distance. Some people commute that far to work each and every day, one way. In racing terms, it’s only 1/10th of the distance for the biggest races of the year at Daytona and Indianapolis. Heck, it’s only about eight-percent of the distance of NASCAR’s longest race of the season at Lowe’s Motor Speedway (NC). But 50 miles was plenty of distance for the action to get heated up at the tight Riverhead Raceway on Long Island. That’s where the NASCAR Whelen Modified Tour rolled into this past weekend and where Donny Lia rolled out of, taking the victory in the track’s August race for the third year in a row. “I don’t know,” said Lia. “I just get around this place really well. Why? I couldn’t tell you. I have more experience at Stafford than here probably by now. We just keep plugging away and if we have a little bit of luck, we’re right there. There weren’t very many openings in lapped traffic for Lia at Riverhead. He raced wheel-to-wheel and nose-to-tail with several drivers during the night. 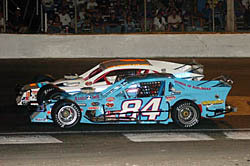 Ted Christopher, Dave Etheridge and several other guys fought spirited battles with Lia’s #18. But it wasn’t for the lead, it was just to stay on the tail end of the lead lap. Lia doesn’t feel that as the race leader, he got much help from the flagman in trying to get through lapped traffic. Behind Lia, Hirschman and Marquis were the cars of Chuck Hossfeld and Beers. Those drivers make up the various positions between second and sixth in the standings and all gained ground on point leader Ted Christopher, who struggled through the night but recovered to post a 10th-place finish. 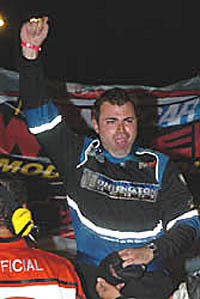 Speed51.com will have more from Riverhead later this week with our Modified Leftovers. after getting caught in a wreck and having a flat tire. Tony Hirschman got to Lia’s bumper late, but didn’t have enough tires to make a winning pass. Lia meanwhile, didn’t have any of those problems. He just stayed out front, navigated the lapped cars and won. So what’s Lia’s secret at Riverhead? 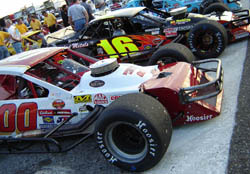 The #00 of John Blewett and the #16 of Mike Stefanik shared the front row (Top - 51 Photo) awhile the #84 of .John Fortin led early. (Bttom - Howie Hodge Photo). Wrecks and flat tires ended the day early for all three drivers.